Sixty-three today, and the last of that round of snow is gone, except in a few piles, or in shady places. Forecast is for another round of off-and-on snow this week, and temps of 20 to 40. 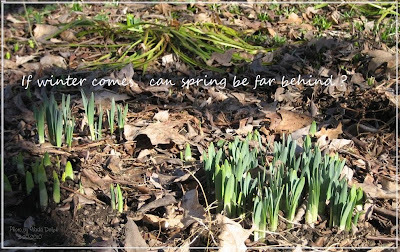 Meanwhile, all the spring bulbs are pushing up. I'm looking forward to all those flowers! And the end of winter. I'm ready for spring! 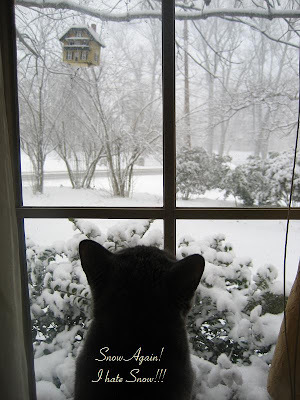 However, since I don't have to be working outside, or commuting, the weather is more bothersome to the cat, than to me. She's getting cabin fever, I think. We've been very lucky here, this winter. The major storms that have hit the eastern states have just about all bypassed us, in this part of Kentucky. This is the most snow we have had at anytime. And I suppose there may be about 5 inches now. We often get more "winter" in February than in January. I don't mind staying in and sewing, reading, watch a movie, and just goof off. Oh, I forgot to mention, eating. I seem to do all those things in equal proportions. Hehe! Hope you all had a happy Valentines Day!